Whether you want to repair the roof on your home or install a new roof, you should work with a roofing contractor that has amassed considerable experience in the field. Roof repair and installation requires a tremendous amount of technical expertise, which Hallmark Homes Remodeling offers our loyal customers. We recruit the brightest minds and most experienced roofing contractors working in greater Boston. Our company has performed highly rated roofing repair and installation projects for over 30 years. Read our customer testimonials to confirm our outstanding reputation. We acquire much of our new customers from word of mouth advertising that recommends our company to friends, family members, and professional peers. Repairing or installing asphalt roofing shingles requires little upfront costs. As the most affordable roofing option, asphalt shingles appeal to customers who operate on tight home improvement budgets. With an average lifespan between 15 and 30 years, asphalt shingles deliver incredible value for a low upfront cost. Our team of experienced roofing contractors can install an entire new roof of asphalt shingles in just a few days. That is, if the weather cooperates in greater Boston. 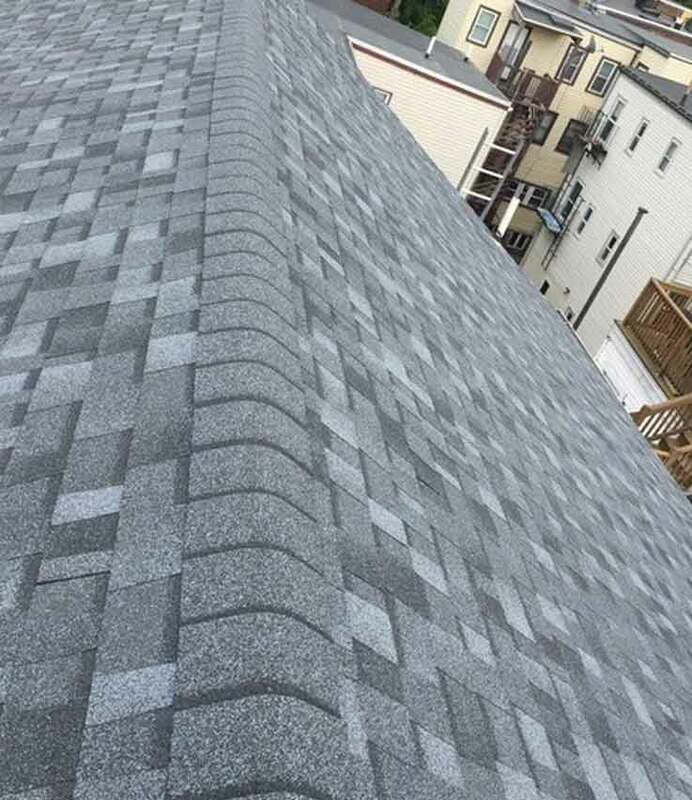 Did you know that if you allow a professional roofing contractor to perform regularly scheduled slate roof repairs, your slate roof will outlast you and everyone living under the same roof. Aesthetically appealing slate resists damage caused by fires and Mother Nature’s worst weather. Professional repairs done on your slate roof can create a roof that lasts between 150 and 300 years. The key to slate repair is to schedule appointments the same way you schedule visits to your doctor or dentist. Before you leave the dentist office, you set an appointment with the receptionist about six month down the road. The same principle applies to slate repair. From a minor repair to a major renovation, when the project is over, you should schedule another visit from your roofing contractor within the period recommended by the roofing professionals. Now that we got the need to schedule regular slate repair appointments out of the way, the question you must answer is which home improvement company will you turn to for performing the repair work? We will give you a hint: Go with the proven slate repair experts from Hallmark Homes Remodeling. Every home improvement contractor want to create a competitive edge that helps the company gain more customers. The problem is most home improvement contractors are decent at several jobs, but masters of none of the jobs. Hallmark Homes Remodeling specializes in six areas of home improvement projects. One of our specializations is performing slate repair projects. You might be surprised to learn that many slate repair contractors do not spend time perfecting their trade. That is not the case with the team of slate repair professionals at Hallmark Homes Remodeling. We constantly ask our team of experienced home improvement professionals to take classes that teach the latest slate repair techniques and use the most advanced technologies. Hallmark Homes Remodeling takes slate repair seriously and our customer testimonials confirm we are the leaders in providing slate repair services in greater Boston and in surrounding New England communities. We replace a few deteriorating slates or install a new customized slate roof that makes your home the object of envy in the neighborhood.